The Carol Service or Carols by Candlelight service at St Silas is always a big event and has had a variety of implications for visuals in past years. I thought it would be worth making a short case-study from this year’s event as there is a good mixture of different techniques and effects in the use of video, VJing, art and lighting. The carol service takes a traditional pattern of carols and readings with a message towards the end. Some of the carols are performed by the choir, soloists and band and some include the congregation. The readings were either presented on video or by two readers (from the church pulpit which isn’t normally used any more, so using church architecture for visual impact). The talk/sermon/message bit is towards the end of the service, after the ‘main plot’ of the Christmas story has been presented and the song following it usually has a responsive element. Starting with the physical set up of the building, we don’t normally have a choir and this one took up the entire width of our stage so the band were put off to one side. As historically this service is often busy and some times people have to be turned away, so we squeeze in as many chairs as we can while trying to give people good sight lines. Above the stage we hung a large triangular canopy, 8m wide and 9.7m to the peak. This canopy was custom made this year by Scenegineering for this service with the idea of using it for lighting and projector effects and to frame the stage in a different way. We also hung two large pieces of fabric behind the stage on either side of the normal 10’ x 8’ fast fold screen, these sheets were swept back from top to bottom to give a similar effect as the canopy and meaning that we could uplight all this fabric with LED lighting to wash them with different colours. Other lighting was more functional, to light the choir from the front and back and to provide controllable ‘house-lights’. 6 Fresnels to light the full with of the choir and the rest of the stage (because you never know where the main speaker will speak from or move around). 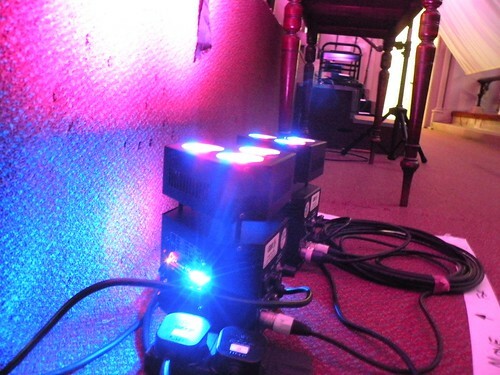 6 Dichroic flood lights (gradated between two colours) pointing at the roof for general ‘house lights’ before and after the service. As well as lighting we had three projectors ‘painting’ the walls, rafters and canopy with visuals as well as the more usual /functional projector on the usual 10×8 fastfold screen in the center of the stage (and one last projector up in the organ loft for the choir to see their song words). Mac Powerbook Pro running arKaos grandVJ, this was driving the three projectors that covered the canopy, walls and roof space. 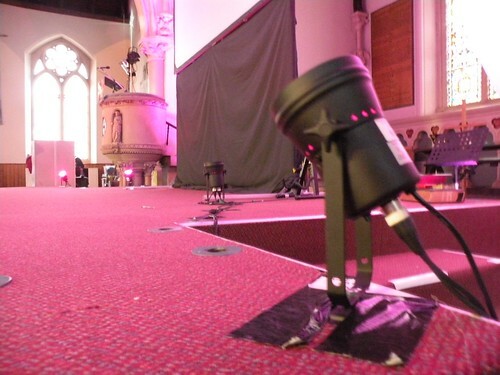 Despite apperancies this is a fairly simple setup, there are two outputs – the ‘main screen’ on stage and the ‘rafter projectors’ (three projectors to cover the differnet areas of the church roof and canopy above choir). 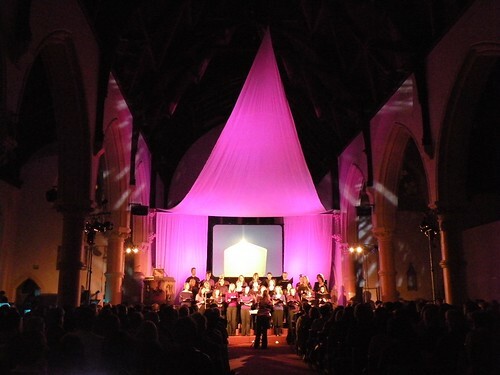 The main screen is cotrolled by the Panasonic Video Mixer which can choose from DVD players, EasyWorship feed and the feed from GrandVJ on the Mac. While the rafter projectors come only from GrandVJ. I’ve put together a sample of most of the actual videos and visuals used on the night (note that not all of the audio is from our Carol Service, but it should give you an idea of what was going on). All these videos created and displayed by DeepRiver with specific credit to Alan who made the ‘John 1’ video. This is edited with my notes of what we used and how this looked during the service. this video was a quick test of some of the settings we planned to use recorded during the last rehearsal. This entry was posted in case study, Christian Worship, Uncategorized, Visuals in Worship and tagged christian visualist vj. Bookmark the permalink.